Place your bets & get ready for the derby. Our colorful Fun Derby race track has three starting gates and inflated horses for your guest jockeys of every age and size. 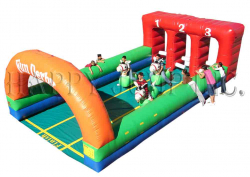 Riders will have a blast hopping down this inflatable race track as the crowd cheers their favorite horse to a photo finish. Be the first to get your horse across the finish line to win the race. The game comes with three inflated horses sized to fit your party goers. Guests mount their horses, line up at the starting gate, hold on, push off with their feet and bounce along the track on their horses made of strong, heavy weight material. The first player to reach the finish line and pass beneath the winner’s arch wins the race!